Berlin [Germany]:Prime Minister Narendra Modi was accorded a ceremonial welcome on Tuesday as he began his two-day official visit to Germany. 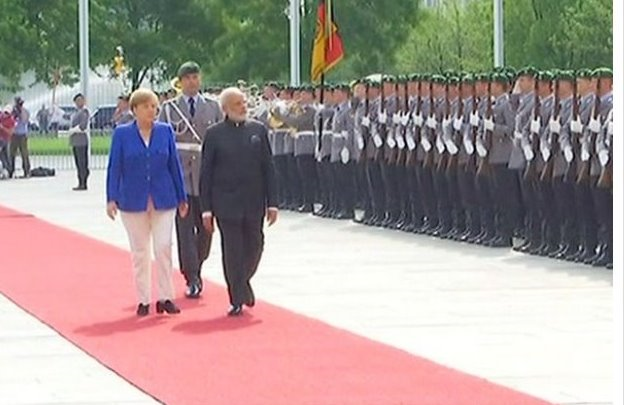 Received by German Chancellor Angela Merkel, Modi was accorded the ceremonial reception, where the national anthems of India and Germany were played. The Ministry of External Affairs had earlier said in a statement at the end of the first day of Prime Minister Modi's two-day Germany visit, "The two leaders discussed Afghanistan and reiterated their support for an Afghan led and Afghan owned reconciliation and development process. There was discussion also on the issue of radicalization and terrorism and each countries experience in dealing with this." Both the leaders also discussed Brexit and the impact on India and Germany and on the future of the European Union . The statement added that Prime Minister Modi also appreciated Germany's presence in Afghanistan to provide stability and called upon the need for consolidation of efforts in Afghanistan. "The leaders also touched upon OBOR (one Belt One Road). There was some discussion on climate change issues and the leaders discussed the possibilities including in the G 20 contact, there was exchange also on happenings in the international arena," said the MEA. The two leaders also reviewed Brexit, its effects on both India and Germany as well as the future of the European Union (EU). The two sides, during bilateral talks, also discussed how Germany can partner with India on its flagship programs including skill development, energy sector, environment, smart cities and digital India.